'Back in the Saddle' Gene Autry's ubiquitous theme song never got old for 'the Singing Cowboy,' remaining a mainstay for his entire career as an actor, singer, and owner of the Anaheim Angels. Gene Autry, "the Singing Cowboy". "Back In The Saddle" was one of Gene Autry's biggest hits, and he had a lot of hits. He was a radio and TV star, and he made 93 cowboy movies. In 1941, he used the title of the song as the title of a movie. Like most of his films, "Back in the Saddle" is set in modern times, and Gene Autry plays what he called a kind of New Deal cowboy, fighting big business and special interests. The movie opens at the Madison Square Garden rodeo in New York City and moves backstage with a radio reporter to where the cowboys and cowgirls are packing up their gear. Autry's comical sidekick, Frog, was played by Smiley Burnette, but many of his songs were written by another cowboy movie sidekick, Ray Whitley, who wrote "Back In The Saddle Again" in 1938. David Rothel, the author of the Gene Autry book, talked to him 40 years later, and Ray Whitley told how he'd written "Back in the Saddle Again." "It went like this. I got a phone call about, oh, 4 or 5:00 in the morning. I answered and talked with my producer. And I hung up and came back into the bedroom very sleepily. My wife said, `Well, what was that all about, anyone calling at this hour?' I said, `Well, I'm back in the saddle again.' She says, `What do you mean, back in the saddle again?' I said, `Well, they told me that they had room in the picture for another song, if I could write another one between now and 8:00 this morning,' at which time we had our recording session. And she says, `Well, you've got a good title.' I said, `What's that?' She said, `"Back in the Saddle Again."' And I sat down on the side of the bed, and I wrote the first eight lines of the song, and I said, `Now when we get to the studio, I'll put a whoopie ty-yai-yo and a whoopie tai-yai-yea, and maybe a yodel and we'll have a song.' "
Ray Whitley wrote the song for a movie called "Border G-Men." Autry heard it and had a feeling about it. It reflected the Singing Cowboy view of the West as a better place, as well as Autry's own good-natured optimism. It became his theme song on his radio show, "Melody Ranch," and later on TV. He sang it at dozens of personal appearances every year. Eventually, most of the country knew the song, but Ray Whitley sang it first. Whitely sold "Back In The Saddle Again" for $350, a pretty significant amount of money in 1938, writer David Rothel notes. And even though a little piece of that song's residuals would have added up from all the zillions of times it's been played, but didn't let on that he had any regrets for selling it. "Autry was buying songs from his sidekick, Smiley Burnette, for $5 and $10, so this was a pretty high-price song for the times. Maybe in the dark of night that thought might have passed his mind. But he certainly never in any of his interviews, any of his public appearances when he sang the song and talked about it, never did he ever express any regret that I know of. They were very good friends. And Whitley performed with Gene Autry and also Roy Rogers on many of their personal appearances." Gene Autry tinkered with "Back in the Saddle Again," recorded it, put it in movies and spent the next 60 years living with it. 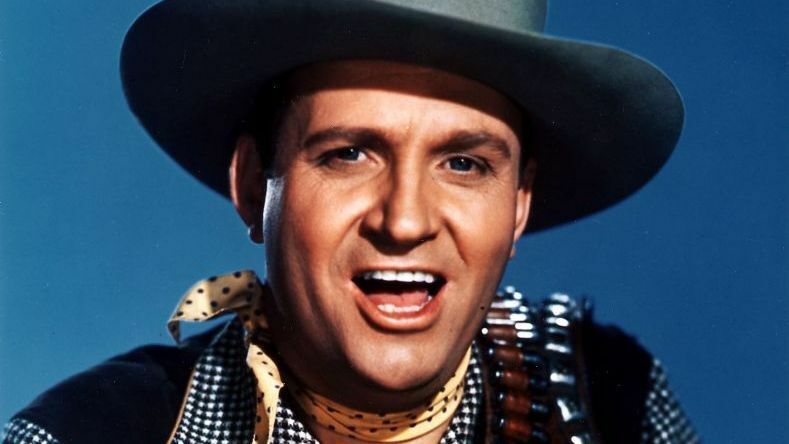 Alex Gordon worked for Gene Autry for most of that time. "He liked the idea of friendship, out where a friend is a friend," Gordon says. "He seemed to make friends with everybody very quickly. And people liked him, and also he always played himself in all his movies and television movies. He was always Gene Autry the radio star, or Gene Autry the rodeo star or Gene Autry working for the sheriff's department or whatever. But it was always Gene Autry playing himself, unlike other cowboys." Gene Autry flew transports in the Pacific theater during the war. He came home to find Roy Rogers the number one singing cowboy. In his autobiography, also called "Back in the Saddle Again," Autry says the war made him think about the uncertainty of the future, and he made a plan. He got back into movies and began investing, first in radio stations. Autry regretted that he didn't save the title, "Back in the Saddle," for his first post-war movie, because it had a special significance then. David Rothel again. "There was a fair amount of fanfare when he came out of the service and he was back in the saddle again. And there was a lot of that post-war feeling that, you know, getting back into the swing of things." Autry made at least a dozen recordings of "Back in the Saddle Again," but this is his favorite, a mellow version recorded just after the war in 1946. "Back in the Saddle Again" was Gene Autry's second gold record, the 1939 version. Douglas Green is a music historian. As Ranger Doug, he still performs Gene Autry's music with the group Riders in the Sky, and here speaks on where the music of the singing cowboys comes from. "I think all of those men were influenced by the records of Django Reinhardt, by barbershop singing, by gospel quartets, by everything that they'd grown up with, everything they were listening to on the radio. And then they distilled that and put it in a Western setting." As Mr. Green explains, there something about this song that you could just hear it over and over, sing it over and over, and he could perform it over and over. "It has an immediacy. It has a vision of the West which is very comforting. It has a wonderful lilting little melody, and it has Gene Autry's voice. You can't deny that either. He personalized every song that he sang. He was no technically great singer, but he had one of the most warm, intimate voices in the business. And everything he sang, he just had that kind of sun-baked Southwestern feel that kind of made you feel good." Gene Autry made his last movie in 1953. He was fabulously wealthy by then, owning radio and television stations, hotels, ranches, production companies. He was a businessman, but he still had that song. Alex Gordon now works for Autry Enterprises. "People who come in, whether it's a delivery boy from Federal Express and so on, when they see it's a Gene Autry office and they haven't been there before, they sort of grin and they say, `Oh, Gene Autry,' and then they might go, `Da-da-da da-da-da da-da,' or, `I'm back in the saddle,' and kind of make a joke out of it, you know?" And yet, Gene Autry never got tired of it. "Well, when Gene liked something--and he liked most of the work he did, his movies, recordings, everything that he did, personal appearances--and very often the audience would then join in at the rodeo or something. You know, and they knew the words. Even General MacArthur liked the song. It was one of his favorites. At the end of one of the tours, he took me with him to see General MacArthur on a personal visit that MacArthur had invited him to the Pentagon, and MacArthur not only gave him an autographed photo to Gene and to me, but he even hummed a couple of lines and just a couple of words of "Back in the Saddle" as Gene walked in." Gene Autry bought the California Angels in 1960, which he said gave him as much fun as a grown man can have. When he went to the ballpark, he'd visit with players in both dugouts, wave his white hat to the fans and, says Carla Buelman of Autry Entertainment, the song would still be there. "Imagine a man in a Western cowboy business suit, a white hat and his walking stick, coming in and greeting everyone, saying hello, and then sitting down and watching his team and enjoying the team, and keeping the score for every single game. I mean, that's amazing. And they would play clips, and it would be of Gene catching the bad guy or riding hard on Champion, and then just playing music in the background. A lot of fans will ask me, `What was Gene Autry really like? What was the man really like? You got to know him.' And I can honestly say the Gene Autry you see in the movies, the Gene Autry you saw on the personal appearance tours, the Gene Autry you heard on the radio, that was the real Gene Autry."